I am so excited to share with you Pastor Mala’s latest update on a truly remarkable event in Malawi. First, let me give you some background. For a few years now, Mala and his church have been conducting evangelistic ministry at Chancellors College, the largest campus under the University of Malawi. At least three times each month they preach to small groups, and twice a year they address crowds of 400-500, including staff and faculty. After these larger events, Mala had been hearing of complaints from the students: “We want prophets and miracles. Why do they keep bringing this guy who only preaches the Bible?" Hearing of these criticisms, Mala and his church saw the need to strengthen the few students who seemed to be responding well to their preaching. They came up with the idea of a ‘Theology Bootcamp’ - a weekend of Biblical teaching to ground these students in the Doctrines of Grace. The church expected around 30 students to show interest, 40 at best. The event was advertised and 80 students registered in the first 2 days! By the third day of registration, 110 had signed up! At that point, Mala quizzed his student leaders, “Did you make it clear what this event is about - that it is only Bible study?” They insisted that they had, even listing the session topics on the posters. Within a few more days, 180 students had signed up and they had to close registration! They now faced a major logistic challenge, having planned for 40 and now needing to care for more than 4 times that number. 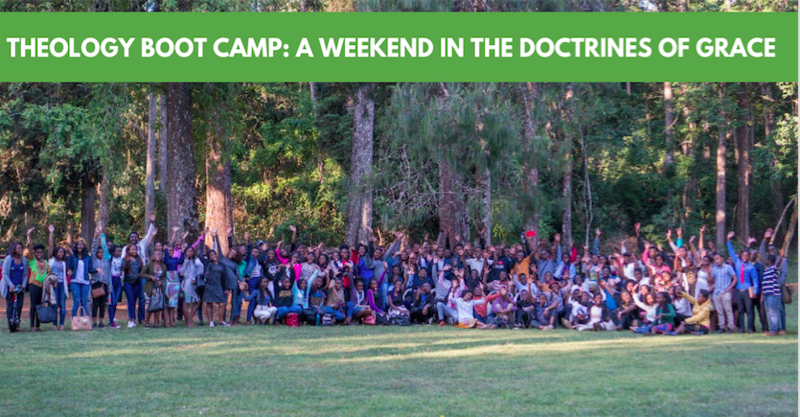 “Why a Theology Bootcamp? Malawi has a population of 19 million people. 70% of that population are young people. So you can see where the future of the church in Malawi lies, especially regarding the reformation of the church. Between 2019-24, these university students will graduate to be lawyers, doctors, accountants, economists, teachers, engineers civil servants, etc. We hope we send out into the world an army of Bible-thumpers in the name of graduates. We believe that Malawi needs strong churches in the cities that will, in turn, replicate themselves, God-willing. We praise God for a successful weekend studying the doctrines of grace with over 170 students. Our goal was to give these men and women a theological framework through which they can interpret the Scriptures, and give them a solid foundation in their faith. Our church worked so hard to make this event possible with very little resources. As a pastor, watching a small church work so hard encouraged me very much. At the beginning of our sessions, you could sense some resistance as we taught through the holiness and sovereignty of God, followed by the doctrine of total depravity. By midday, it was evident that the Holy Spirit was at work in the hearts of the men and women present. As we talked and interacted, we were hearing requests for more of such meetings so they can be grounded in the truth. This was very encouraging to us. We concluded teaching these men and women on how the doctrines of grace apply in the areas of biblical manhood and womanhood. The response has been beyond our expectations. Like many of my reformed brothers and sisters, I too am weary of short-lived professions of faith. Yet there are many times I have felt that my suspicion of immediate testimonies of conversions are a hindrance to the work of the Holy Spirit in conversion, and wonder what should be my expectations from the power of the gospel. We had quite a few men and women openly talk about their struggles with besetting sins. These men and women began to be real about their issues. We had one man who openly confessed sins, having been exhorted to look to Christ. He told many of us that he believes the Lord had saved Him. Please remember him in your prayers that the Holy Spirit will give him full assurance of God's love. What now? The Lord has been blessing our ministry in Zomba. Even though our work there started with students, there are now many people, including university lecturers and staff members who are attending our events. Please pray that the Lord will continue what He has started in Zomba. Also, pray for wisdom as we consider the best way possible to disciple those whom the Lord is bringing to us in that area. It is our hope that the Lord will remember this area and raise up a strong church that can eventually spread reformation east of Malawi, which is alongside the lake where Islam is still strong and growing. I do not see how one can reach out to the Muslims along the lakeshore without good churches in the Zomba area."